BUVET TE IS THE PERFECT SET TING FOR AN I N T I M AT E D I N N E R , G R O U P B O O K I N G S O R SPECIAL OCCASION. WE OFFER A SELEC TION OF MENUS AND BANQUET OPTIONS FOR BOOKINGS OF OVER 8 PEOPLE . Malcolm Southwell, of Queanbeyan… hit in the head by a fragment of shell near Gueudecourt, France, in 1916. Nurse Flora Gallagher, of Bungendore… signed up for the nursing corps with her sister Evelyn and their cousin, Janet. and (by then) the Canberra region, potentially up to 120 families sent more than one of their own to fight halfway around the world for a cause they were not always entirely sure of. In some cases, it was all of the males under one roof. A wider known example of such familial tales include descendants of grazier John Single, of Castlereagh, in NSW. Thirty-three went to war. Nine were killed, three of them on the same day. The Southwells, one of Queanbeyan’s earliest pioneering names, had as many as 10 go to war (four lots of which were brothers). One was killed: Malcolm, near Gueudecourt, France, in 1916; hit in the head by a fragment of shell as he went to fill his water bottle. (c) Carroll & O’Dea Lawyers 2017. Liability limited by a scheme approved under Professional Standards Legislation. NO WIN. NO FEE. NO OBLIGATION. Seats strictly limited so RSVP essential. When it matters, contact Carroll & O’Dea Lawyers. The presentation will take you through proven strategies for building your wealth. This is not a get rich quick seminar. However, if you want simple, effective and practical strategies for achieving financial success, then this is a must attend. Responsibility for election comment is taken by Ian Meikle, 9b/189 Flemington Road, Mitchell. If you want to be in the 10% who achieve wealth, don’t miss our free Pathway to Wealth information sessions. Cover: Soprano Jane Sheldon. Story Page 23.
to be Lieut Christopher Henry Duncan Champion, who died on April 14, 1918, at the age of 25. All four were buried with full military honours. And then there were three Gallaghers, also of Bungendore: sisters Flora and Evelyn who signed up for the nursing corps with their cousin, Janet. In Queanbeyan, the Dawsons sent seven sons to war. While, statistically, approximately one in five Australians died during this time, incredibly, each of them came back. From a personal point of view, as a mother with sons of an age that meant they could have marched off just over 100 years ago, to imagine those women waving their men goodbye – pride inevitably conflicting with dread – brings into stark relief the true sacrifice of not only those who served and others who laid down their lives, but entire communities, too, during and long after. These words adorn the Roll of Honour at the historic Queanbeyan Public School (QPS), commemorating 126 former students that served in the “Great War”, 28 of whom fell. Despite early recruits being required to be at least 21, they could sign up from the age of 18 with parental consent. And with or without it, thousands would. Plenty much younger, also. In reality, many were barely men; often, little more than boys from country towns such as Queanbeyan, any number of whom had probably never ventured much further than from where they’d grown up. Brothers though, they certainly were – not only in arms, but with distressingly high frequency, in actuality. And as Anzac Day approaches, the impact of this at a more intimate level deserves reflection. This year is the centenary of the signing of World War I’s Treaty of Versailles, officially heralding peace (not just ceasefire) – most memorials bear the inscription 1914-1919 – and when those who remained came home. It’s also a poignant time to think on those who didn’t. Almost 420,000 Australians enlisted from a national total of just shy of five million, constituting some 40 per cent of the eligible male population. Of course, all were volunteers – a goodly proportion willing; others, dutiful. Of elections, Greens and Mike Kelly’s choppers BARELY hours after PM Scott Morrison called a Federal election for May 18, news teams were on the streets of Queanbeyan – the heart of the once bellwether seat of EdenMonaro – feeling the pulse. LATEST stats reveal the capital is now officially the most expensive city in Australia in which to rent, with houses here around $30 higher a week than in Sydney. And to make matters more stressful for renters entering the market, scammers are also active. One newcomer to the region applied for a rental property in Lyneham, only to be told they needed to shell out $2400 via bank transfer before being able to inspect the property. He quickly smelt a rat and notified AllHomes, which took the apartment off its listings. The property later reappeared on HomeAway.com, again being quickly deleted. Mike Kelly’s touched-up teeth outside his Queanbeyan office. days after the attack waiting by the gate for Mimosa to return, but is back to his regular gig of visiting patients at Clare Holland House. IN local politics Liberal MLA Mark Parton is indeed a brave man. Taunting animal rights activists has been a free-for-all this week, but as a public figure Parton is certainly inviting strife. The former radio man tweeted: “If you wanna be vegan, all power to U, but DON’T FORCE IT DOWN MY THROAT. Don’t trespass on to hard-working farmers’ homes and properties. And leave meat workers the hell alone”. • CHAIRS • TABLES • DESKS • WORKSTATIONS • BOOKCASES • FILING CABINETS • COMPACTUS • METAL SHELVING • PLUS PLENTY MORE! is: can the government fairly say in response to this mounting criticism that it is doing no more than respecting the clear mandate from the people of Canberra to proceed with the tram and that its expenditure priorities, which have, for example, involved massive cuts to health, simply reflect the will of the people? Can anyone really deny the government the right to say that surely we all knew, when we voted for the tram, that the billions of dollars it is going to cost had to come from somewhere and where else if not from the health budget. Jon Stanhope was chief minister from 2001 to 2011 and represented Ginninderra for the Labor Party from 1998. He is the only chief minister to have governed with a majority in the Assembly. Dr Elizabeth Gallagher (Obstetrician/Gynaecologist) and Dr Omar Adham (Obstetrician/ Gynaecologist) with the MonaLisa Touch System. when they drove past. These guys were 10 years younger than us, but they had the ability and power to intimidate, frighten us. We all felt embarrassed about what happened, but now I feel angry. Nothing “happened”, we got home safely, but the memory of those leering “boys” throwing their milkshake in disdain, takes me back to how small and powerless I felt. Women deal with fear and threat every day. We are conditioned to check behind our shoulders, to quickly find polite excuses to leave when conversations become creepy and even to hide from men when we feel scared. Tragically, the recent murders of women in Melbourne as they were walking home, shows that sometimes women don’t have a chance. Perhaps men don’t realise how scared we really are, but it’s time you knew. I don’t offer this commentary to point fingers at men, but I truly wish men and women could continue to work together for a future in which my daughter can move around this world, free from harm and fear. That she doesn’t have to constantly regulate her behaviour and look over her shoulder. I offered the following advice to my male relative for his morning walks – what about slowing down or crossing the road yourself to give the woman some extra space? When she’s alone in the dark, she’s vulnerable and can’t assess if you are just a “good” guy taking a walk or someone she needs to be wary of. These minor suggestions might seem crazy, but perhaps a fair exchange in light of the constant adjusting women make each day. Win for recruiters CANBERRA company face2face has been awarded a national award for Recruitment Services at the Australian Small Business Champion Awards 2019, the only ACT company to win in any category. A record 2200-plus applications were received and 16 ACT companies were finalists in a variety of categories. Face2face was also a finalist in the Business Entrepreneur, Business of the Decade and Business Growth Award categories. A view from Red Cross EMMA Turner will speak about Red Cross services and volunteering at the next lunch meeting of the Weston Creek VIEW Club, at the Southern Cross Club, Woden, from 11am, on Tuesday, May 7. The cost is $28. The club welcomes new members. Bookings to 0408 864616 by 5pm, May 2. SATURDAY 20 APRIL 2019 Your ticket to ride Celebrate with music, live entertainment and activities for the whole family at the Gungahlin and City Termini from 9am – 4pm. One way to judge where things are going is to assess statements made by someone holding down what should be the most important position in shaping this city for future generations. key performance indicators (KPIs). The points published in that April 19, 2017, article have been edited below to 10 points in italics, short comments added and a score out of 10 has been allocated to each. Let’s see how the chief and his directorate are going based on things said often by residents at community meetings over the past two years. 1. Pursue a “citizen focus”: Residents constantly talk about and witness how planning and development is not about residents but about so-called economic development. Score 2 (out of 10). 2. High quality public spaces and improved environmental management: Trees are disappearing, public spaces used for developments, West Basin as a suburb is still being pursued, heritage ignored, proposed Northbourne apartments are not anything to rave about. Score 2.
do not see any trust being built. Score 2. 9. Deal with people feeling like they haven’t been engaged early enough and they’re surprised at what they’re reading about and what they’re seeing: Surprises remain normal. Score 3. 10. If you have people joining you on the journey early as you work up the proposal, you’re going to have a smoother ride: Oh dear! If it was a smooth ride, why are residents continually raising objections to almost every major development? Score 2. That’s a total score of 19 points out of a possible 100. Anyone receiving such a dreadful low ranking would be counselled and asked to rethink their future. Given the influence the chief planner has on the city’s future, maybe residents should get to vote on who gets this high ranking planning and sustainability position. The score applies to the whole planning directorate with Ponton as the boss who answers to Mick Gentleman, the Minister. Anyone wish to estimate his score? Paul Costigan is an independent commentator and consultant on the visual arts, photography, urban design, environmental issues and everyday matters. MR BRAND MAN & APPARITION ONLINE have teamed up to create a complete ONE STOP SHOP for branding your business Our packages include adding your brand to: • Your clothes • Your vehicle • Shop signage • Websites • Business Card Designs • Google Ranking • Plus everything else you are going to need! Beware the sharp politics of fear and negativity LIKE war, the first casualty of an election is truth. The propaganda has already started. The first salvo from the government is a blast on who can manage the economy. Prime Minister, Scott Morrison, says it has taken them five years to repair the economy because, apparently, Labor left the country in ruins. Mr Morrison may not be stooping to World War I tactics presenting Labor as eating babies. However, he has already launched into the politics of negatives and fear, arguing we were much worse off six years ago under Labor. Liberal propaganda offers “a stark choice” between his government and a “Bill Shorten Labor Party”. While Bill Shorten lags in personal support in the polls the Liberals attempt to frame the conflict as between themselves and Bill Shorten rather than between Labor and Liberal for government. The truth is a casualty in the reframed message in two ways. Firstly, Australia does not run presidential elections. has opted for Scott Morrison – after a failed coup intended to elevate Peter Dutton. As Labor is not in government, it is forced to run both a vision for the future and a negative propaganda campaign. It knows how effectively its campaign to protect Medicare worked at last election. Now it is attempting to frame Medicare as a Labor positive with a huge promise around its role in treating cancer. They have also presented policies on negative gearing and franking credits to achieve a “fairer Australia”. Labor’s prime negative pitch has already commenced in exposing Liberal and National Party infighting. The battle between the conservatives and socially progressive liberals is barely kept in check, even within the election context. An unstable, divided party can never win an election. This is a vulnerability Labor has already commenced exploiting. Electioneering on the politics of propaganda, negativity and fear is a proven formula. However, our democracy and politicians across the spectrum are the losers. The key lesson from current electioneering is that deception, lack of vision and negativity dominate political life. Voters draw the obvious conclusion: our politicians are disparaging people who are not to be trusted. 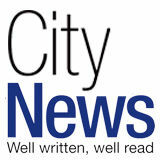 “CityNews” is looking for a confident, skilled writer with at least three years’ experience to assist principally with the preparation of advertising features and write news and features variously for the magazine and its website citynews.com.au CV to editor@citynews.com.au before sunset Friday, May 3. Valley of wisdom or is it named after wildlife? WODEN Valley is said to be named after a nearby homestead, whose owner Dr James Murray titled it “Woden” in October, 1837, after the Old English god of wisdom. It was a fitting name from Dr Murray, who wanted to spend his life pursuing wisdom. But another man, Dr Harold Koch, questions this and believes Woden Valley’s origins come from the Aboriginal word for possum. The Aboriginal word, either “wadyan” or “wadhan”, became known to English speakers as “Woden”. The traditional custodians of the district are the indigenous people of the Ngunnawal tribe. Hellenic Club hits the big four-oh! Daana Catering owners Sanjay and Sunita Kumar. THE Hellenic Club was established in Phillip after an overwhelming social need for Canberra’s Greek community came to the fore in the late ‘60s and early ‘70s. “They needed a place to bring their families alongside their Greek and Australian friends,” says operations manager Mick Douros. “They needed a place they could call ‘home’.” The Hellenic Club has since been serving the community for 40 years, and Mick says this significant milestone was celebrated on February 24. He says the birthday celebrations have been in full swing, with more than 50,000 members as well as the whole community embracing the cultural and customer experience that the Hellenic Club prides itself on. It’s ALWAYS the food that people remember ! With Daana Catering, those memories will be a talking point for all the right reasons. For seamless professional catering that really makes an impact, let the multi award winning team from Daana Restaurant and Catering take care of your event. Daana Catering offers: • Catering services for any size group 15-500 • Catering options to match any budget • Corporate Catering, Conference Packages, Functions & Events • Convenient Online Ordering System • Venue hire also available Winners of Best New Restaurant 2017* and Best Indian Restaurant 2018*, our chefs will surprise and delight your guests with their delicious international fare, and friendly personalised service. So, isn’t it time to swap out sandwiches and wraps? Owner of Colleen’s Lingerie and Swimwear Gillian Horton. Lingerie store helps women make the right foundation decisions SINCE opening more than 20 years ago, Colleen’s Lingerie and Swimwear in Garran has evolved and now specialises in bra sizes and styles that are hard to find. Originally Colleen’s Lingerie and Swimwear was established to help women who have had breast cancer surgery with its post-surgery bras. Gillian Horton, a former customer after having surgery herself for breast cancer, took over the store in 2014. “What women don’t know is that anybody can come in and be fitted,” she says. “We’re finding that women who have difficulty finding bras that fit well can come and get fitted. “We cater for large cups, large backs, small cups and front closing bras. THE family-run business Paint Place in Phillip, formerly known as The Decoration Centre, has been delivering quality advice and paint to the region for 41 years, says owner Alex Hetenyi. Initially established by Alex’s dad, the store is backed with two generations of knowledge with Alex joining the team as a teenager, before becoming the owner with his brother, and now on his own. “With the experience we have and the level of knowledge we have, we can solve any project and maintenance issues with the correct advice and correct products from the beginning,” Alex says. Being paint specialists who only deal with paint, Alex says they get a lot of customers complimenting their services. “We’re friendly, we’re backed with knowledge and we can help with any project from staining or oiling your deck to painting the inside of your house or painting furniture. “We offer colour-matching services and have an interior decorator who can help with colour advice in store by appointment. “We service a lot of trade in Canberra as well and have a good, better and best range, which suits any budget.” Paint Place also has allergy friendly paints, which Alex says have up to zero VOCs (volatile organic compounds) in them. “This means people can paint in the home during the day and then sleep in it at night with no problems,” he says. ESTABLISHED in 1986, the team at Capon & Hubert are not only backed with decades of experience but they also love what they do, says its finance director Rhonda Hubert. The team, who work out of Phillip, enjoy assisting its clients and Rhonda says they hope it shows! “A large part of our client base comes to us by way of referral,” she says. “It’s a measure of our success and so is Capon & Hubert finance director the confidence which Rhonda Hubert. our clients and other professionals put in our experienced, friendly and family oriented team.” The staff at Capon & Hubert work in areas such as wills and enduring powers of attorney, estates and probate. Its principal solicitor, Ken Hubert, has more than 32 years’ experience in the Canberra region and specialises in family law and mediations. And, the conveyancing team is headed by Daryn Griffiths who has expertise in commercial and residential property. Conveyancing laws in NSW and the ACT have become quite complex in the last few months. At Capon and Hubert Lawyers we are up to date with the changes in Stamp Duty, Identity Verification, and Tenancy laws. Our Conveyancing Solicitor will apply these changes to your unique situation and work with you for the best result. Celebrating 40 years of the Club Where Canberra Meets. Lew and Rosslyn Rebbeck of Alexanders Furnishings. on Hindmarsh Drive. “We also custom make roller blinds, roman blinds, bonded fabric blinds, honeycomb blinds, venetian blinds and sunscreen roller blinds,” she says. “There are many different finishes and colours to choose from as well.” Alexanders Furnishings, Shop 5, Paul’s Centre, Hindmarsh Drive, Phillip. Call 6281 1611. Cafe couple loves bringing community together over Korean-fusion food WHEAT and Oats’ owners Phattreeya Thongphet and Jinsun Joo love bringing together the community with their Korean-infused food. “We treat everyone like family as we feel so blessed to be part of this community,” Phattreeya says. “We know that people in Canberra are busy bees and we want to help in our own way by providing a more nutritious meal. “We try to make everything in-house as much as possible and try to purchase ingredients or items that are local within the area and Canberra. “Although we are a Korean infused cafe we try to buy the ingredients locally in order to know exactly what we are serving.” On Good Friday, Phattreeya says they will have live music from 9.30am to 11.30am and 6pm to 8pm as well as a new menu for the week. “There is also a free easter egg hunt for the children at 12pm,” she says. “We have live music on Saturday mornings, run many workshops such as macrame plant hangers, kokedama and kids’ cooking class to help introduce healthy options for kids.” Wheat and Oats also does catering and Phattreeya says their most popular items are spring rolls, curry puffs and Korean fried chicken. Owners Jinsun Joo and Phattreeya Thongphet. Wheat and Oats, 22-24 Colbee Court, Phillip. Call 6282 6828, email wheatandoat@gmail.com or visit @wheatandoats on Facebook. Buy a 4L or 10L can of Haymes Ultra Premium paint at Paint Place Phillip & you’ll receive an eftpos card, up to the value of $100. * Now that’s a good time! *Offer Ends 30/04/19. Retail offer only. Conditions apply – see in-store for details. Novelist DH Lawrence and his wife Frieda… living in Thirroul in 1922. Dickson High School headmaster Noel Laughlin. On the beach at Anzac Cove. Ambulance station at Anzac Cove. Participants in 1918 Armistice celebrations. Anzac Day Breakfast 6 am (6.30 am start) Anzac Hall Purchase tickets at awm.gov.au/breakfast National Ceremony 10.30 am Parade Ground For ticket enquiries call (02) 6206 9813 or visit our website. Join us at the Australian War Memorial to remember all Australians who have served and died in war and on operational service, past and present. Hotel offers lots to do on Anzac Day JUST a five-minute walk from the Australian War Memorial, Mercure Canberra is a great location to warm up after the dawn service, or relax after the National Ceremony, says general manager Patina Farnham. Starting from 6am Mercure Canberra will have egg and bacon rolls, hot and cold drinks in the car park, a shotgun breakfast operating in Olims Bar and Bistro as well as a buffet breakfast in the courtyard restaurant. Then, from noon, the front car park will be alive with food stalls and pop-up bars and two-up, which will be followed by the local band, Back to the Eighties. “You need to be there early to get a spot at the front,” she says. advertising feature Service Club celebrates at old site EVEN though the traditional site of the Canberra Services Club was burnt down in Manuka in 2012, itâ&#x20AC;&#x2122;s still around and itâ&#x20AC;&#x2122;s still the spot to go on Anzac Day, says president Mike Kinniburgh. â&#x20AC;&#x153;We havenâ&#x20AC;&#x2122;t gone, weâ&#x20AC;&#x2122;re still here,â&#x20AC;? Mike says. â&#x20AC;&#x153;At the moment there isnâ&#x20AC;&#x2122;t a proper services club or RSL club in Canberra so we need support so we can keep supporting service men and women.â&#x20AC;? The club, which was built straight after the war in the â&#x20AC;&#x2DC;40s, is one of Canberraâ&#x20AC;&#x2122;s oldest clubs. This year, Anzac Day will continue to be acknowledged on the old site â&#x20AC;&#x201C; at â&#x20AC;&#x153;the tankâ&#x20AC;? on Canberra Avenue and Mike says all proceeds will be going to war widows of the ACT. 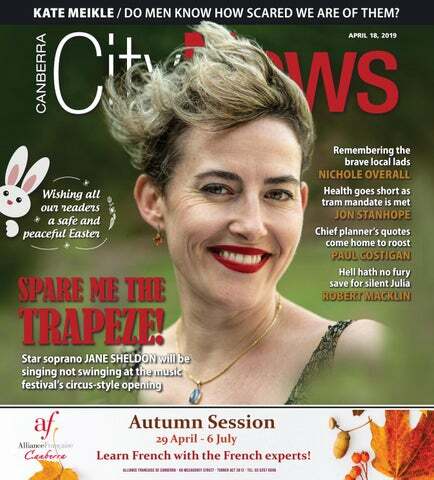 Stay in touch with the names making news on Sundays from 10am as 2CC and “CityNews” present Canberra’s only local weekend news and current affairs program. It’s a revolving panel show that brings to the microphone great “CityNews” commentators and 2CC personalities. Be part of the conversation and call 6255 1206 between 10am and noon. on behalf of Samuel French LTD.
We can take your AVAILABLE PRICE ON vinyl records or APPLICATION cassette tapes and put them onto CD and we transfer VHS tapes onto DVD. MUSIC FOR EASTER Hi-Fi Sales & Service Turntables, Streamers, Amplifiers & Speakers from vintage to new. 1000’s of LP Records in-store! Three66 Espresso Bar’s salmon bruschetta… radish and pickled red cabbage, caper berries, poached eggs, smashed avo and fresh lemon. HEADING to the south coast for Easter? If you’re wandering through the Batemans Bay area and slightly beyond to Mosquito Bay, there are two spots on the water worth a visit. service is friendly but could be more efficient and attentive at times (like the day our entrees were served well before our wine). BEYOND the Bay, at quaint Mosquito Bay, is Three66 Espresso Bar. It serves great coffee and food and is more on trend with the previous places positioned on this precious spot were. They never seemed to get it quite right. This time we were off for brekky, ordering at the counter and lucky to get a seat in the sun overlooking the water. Dishes are beautifully plated and the flavours fantastic. The sweetcorn fritter stack ($19.50) was one of the best we’ve had. It arrived with bacon, wild roquette, poached egg, aioli and a chimichurri tomato salsa. The fritters were crunchy on the outside and packed with goodness. The salmon bruschetta ($19.50) also hit the mark. We loved the radish and pickled red cabbage, caper berries, the poached eggs cooked “just so”, the smashed avo and fresh lemon. Service was painfully slow and we were taken aback by how long it took staff to tidy up a very messy outdoor area – there were dirty dishes everywhere. JJ’s is open seven days, breakfast through to dinner (hours vary) and Three66 Espresso Bar serves breakfast 8.30am-noon. CANBERRA troubadour Fred Smith will sing highlights from his new album “Warries” on Anzac Eve and at the Australian War Memorial’s National Anzac service. The album is a non-jingoistic retrospective documenting a period in which Australian soldiers and civilians deployed into conflict zones in the Pacific and Central Asia as warriors and peacemakers. It is a sequel to his extraordinary “Dust of Uruzgan” album. At The Street Theatre, 7.30pm, Wednesday, April 24. Book at thestreet. org.au or 6247 1223. YOUR FIRST STEP TOWARDS A CAREER IN ACTING Applications are now open for the 10197NAT Certificate IV in Acting for Stage and Screen, Canberra’s professional acting course. Festival director Suzanne Kiraly. her own auction for one of her books. Unlike the big book festivals, which anyone can attend, Kiraly says this one, is “a writers’ festival for writers” with professionally oriented sessions on editing and publishing, pitching story ideas and distributing and marketing work. There’ll also be a short story competition from which the selected winning stories will be published in a book edited by Irma Gold. They did the same thing last year and the result book will be launched on the weekend. One of the quirkiest highlights will be a pitch session, which will be “like literary speed dating”, where a maximum of 20 writers get five minutes each to pitch their stories to members of a panel of publishers. The weekend will open on the Friday evening with the exceedingly popular “Tales after Dark – storytelling for grown-ups” session, where professional actors read out short stories on which the audience gets to vote. Start in July, study at our fullyequipped studios at Fyshwick, and explore acting technique for TV, film and theatre, how to audition, and how to break into the industry. Course info session/audition May 2. Register online. Colourful heather… Mostly low growing, they make an ideal border alongside paths. Winter-flowering callistemons… a light prune after flowering is beneficial. round them to stop them freezing! Iris stylosa... for a fragrant winter cut flower. OF special mention is Iris unguicularis (syn. Iris stylosa), the winter-flowering iris. Usually this iris is not grown to its full potential as the flowers and buds are hidden in a mass of thick, grass-like foliage. Or they are attacked by snails or slugs. This is a real toughie with its home ranging from Algeria to Greece. As such, it is happy in full sun, although equally happy in dappled shade. The best way to get the benefit of the flowers is to cut back all foliage to ground level at this time. This is before the buds and flowers start to appear and snails will have little protection. The lavendermauve blooms have a unique fragrance and are an excellent cut flower, lasting for quite some time. When picking, pull the flowers from their base rather than cutting. Apart from Multicrop Slug and Snail Killer pellets, other slug and snail pellets sold in Australia contain metaldehyde. From personal experience, I contributed to the death of our cocker spaniel when it ate from a packet containing this product left in our garden. Besides pets and birds, it can kill other native fauna such as blue tongue lizards. Check the product when you buy a slug and snail killer. Jottings... • Beware walking under oak trees when acorns are falling. They are slippery on footpaths and can present a hazard. • When repotting containers, place a layer of charcoal in the bottom. Besides aiding drainage this keeps the soil sweet. THE March edition of “The Garden”, the journal of the Royal Horticultural Society, reports that liquids and pellets containing the compound metaldehyde, which is used to kill slugs and snails, will be banned from June in the UK with Environment Secretary Michael Gove saying the chemical poses an unacceptable risk to birds and mammals. • Tree pruning $500 • Tree removal Tree Pruning Day Rate • Hedge trimming 8am-4pm • Hedge lowering • Green waste disposal • Retaining walls MAXIMUM IMPACT! Where would you like to be in 2019? This week boisterous Bulls are raring to go! The Sun/Uranus union activates your dormant adventurous side but slow down before you come a cropper. (As birthday great Charlotte Bronte wrote: “Look twice before you leap.”) You’re keen to get started on a project that excites you but don’t get confused, carried away, and end up way off course or way over budget. If you are creatively focused and financially frugal, then you’ll get much more bang for your buck. The week starts with a career surprise or a drama with a student, classmate, colleague, client or customer, as the Sun and Uranus pair up in your job zone. The more you rock the boat, the more disruptive things will be. Money matters also look rather complicated, especially if your paperwork is chaotic or you’re behind with paying bills. Incoming funds are in a state of flux so the more focused and informed you are, the more manageable your finances will be. A romantic, platonic or business relationship looks very confusing. You think you know the person well but you need to walk a mile in their shoes before you really know how they are feeling. As birthday great Harper Lee observed: “You never really understand a person until you consider things from their point of view.” And are you keen to travel or achieve a major goal? Circumstances are constantly changing so don’t make any firm plans until you have more solid information. Don’t be a spontaneous flash-in-the-pan Sagittarian! With Jupiter charging through your sign you’re full of enthusiasm and are keen to start an ambitious project. Just make sure your fabulous promises and well-meant intentions can last the distance, so you finish what you begin. This week you’re also keen to assist someone in need but don’t offer more help, time or money than you can actually deliver. Remember… words are easy and promises are cheap. Some Fish will bump into an old friend, re-connect with a relative or tangle up with a former flame. But are you living in Pollyanna Land? Remember – memories are so seductive because they’re so selective. You intuitively know what’s right for you - even though you may appear to be confused to others. (Welcome to Planet Pisces!) So don’t let a loved one (from the past or present) push you around or persuade you to do something you really don’t want to do. Freedom-loving Aquarians can only be on their best behaviour and toe the line for so long. So expect the unexpected this week, when the Sun and Uranus stir up your restless (and reckless) side. You’ll balk at restrictions being placed on you by others (especially at home) but resist the urge to be a disruptive influence. Aim to be smart and selective as you fulfil your basic responsibilities… then go off and do something exciting and eccentric somewhere else!